Honda started making their Super Cub about 60 years ago. To call it popular is an understatement, with over 100 million units sold! Around 2009, they showed a concept electric version and said it was in the works. They’ve teased it on-and-off since, but nothing has surfaced. In the mean time, in comes Shanghai Customs. 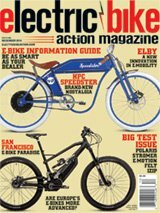 We featured Shanghai Customs’ really cool electric, retro bikes a while back. Their designs look amazing and seem to be built very well. Perfect for getting around a crowded city in style and with almost no carbon footprint or sweat. They take a stock Super Cub, tear it down, and replace parts like the gas tank with a 37V battery and the rear wheel with one with a 2000W hub motor capable of up to 80 km/h (50 mph), or they offer a tamer version, called the eCub2. They also have a kit if you want to be truly DIY. The IC has been replaced with a mount for your smartphone which controls everything and provides you with your “instruments”. Range is on the order of 40 km (25 miles) at 45 km/h (28 mph) with an 80kg (176 lb) rider. Enough to get most commuters to work and back, in style!